Jiminny is the easiest way for sales and success teams to build a culture that focuses the desire for improvement around teamwork, inspiring every player to become a coach. 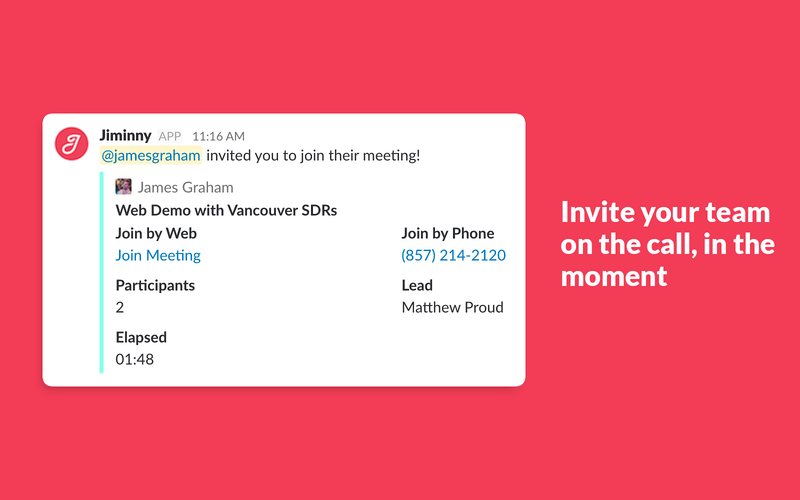 You can consolidate 3 tools in one platform, fully integrated with Salesforce & Slack helping your reps work smarter. 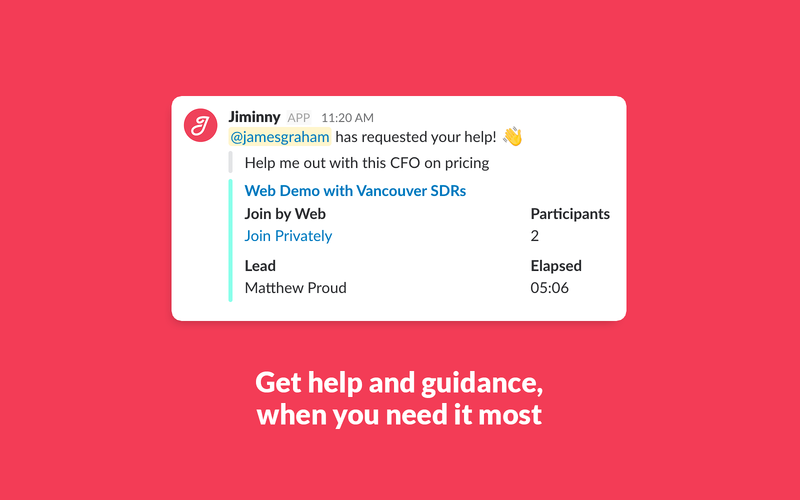 Connect Slack with Jiminny to start online meetings and request coaching with ease.Key features:• Keep up to date with your teammates activity. Sales calls can be shared instantly across your team, see the coaching comments and claps related to your opportunities in Salesforce. Social features encourage team members to support, coach, and praise each other• Got technical question for Sales Engineer? Want Customer Success to wow your prospect? Invite a teammate or start a Jiminny conference by typing /jiminny• Coach when it matters with Live Coaching. 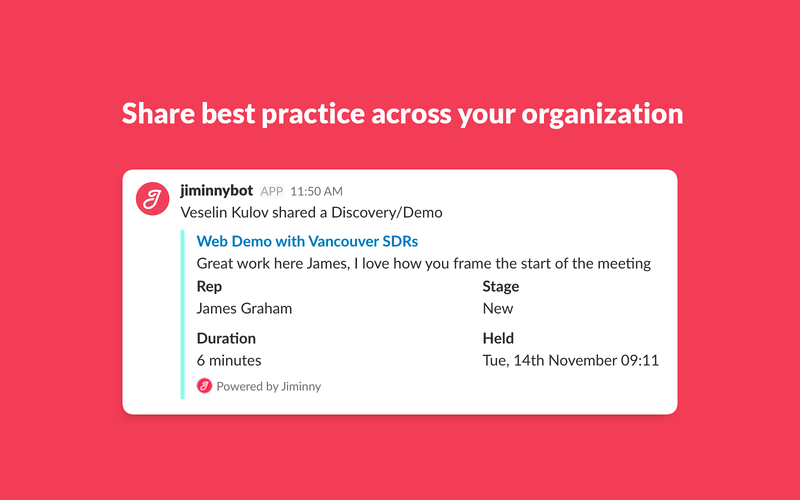 Don’t wait until the opportunity is lost, support each other in crucial moments /livecoach to invite anyone to privately join your meetingSee how your team could use Jiminny! Jiminny will be able to send messages to your workspace. 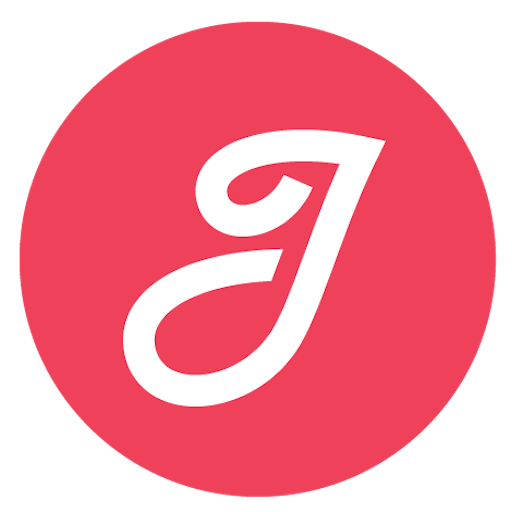 Jiminny will be able to view the email addresses of your Slack workspace’s members. Jiminny will be able to post to specific channels in Slack. Jiminny will be able to install a bot user that appears in and has access to your workspace’s directory. It can also post messages and view activity on messages in any channel it is invited to. Jiminny will be able to access profile information for all users on your workspace, including names and contact information.